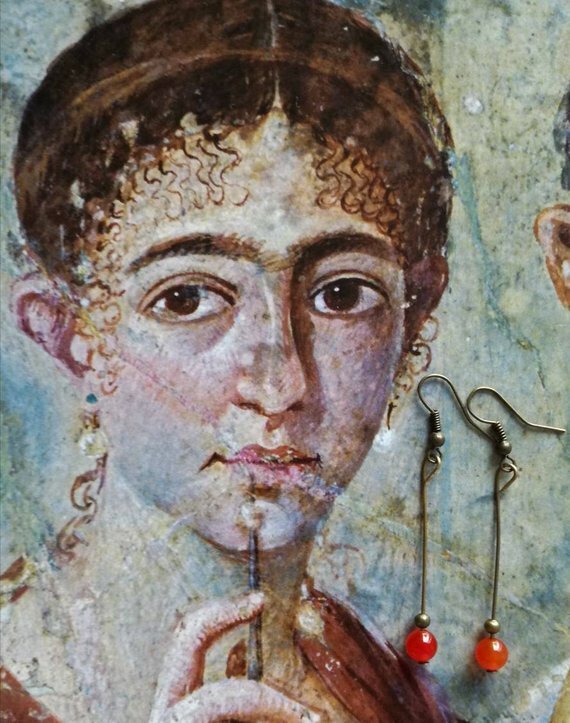 I fell in love with ancient Roman jewelry in all my capacities - as historian, reenactor and artist. 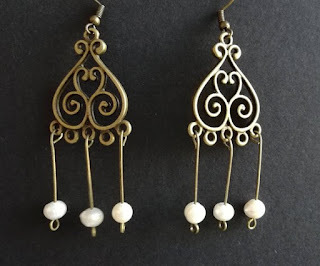 It thus felt natural to start creating replicas, first for myself to wear at historical reenactment shows, then for museums in my area, and now for everyone on Etsy. I hope you like the items and feel free to contact me for suggestions or special orders. Thanks for the visit! Bonum diem habeas! If for any reason you are unhappy with my item(s), please contact me immediately to arrange return and refund, or exchange. You must let me know you are returning an item before you send the item back. I will not refund until the item is returned to us in unused and undamaged condition. You will be required to pay for the return postage and packaging unless the goods are deemed faulty. Once I have received your returned item(s) you will be given a full refund via the payment method of your original purchase. Ana-Maria Gruia, Borhanciului St. 76G, bl. 1B, ap. 1, Cluj-Napoca, Romania.. Unless the item is faulty I am unable to refund shipping costs. Product on photos may seems bigger or smaller than they are in reality, therefore all item descriptions include detailed information and measurements and one of the item photos shows a scale in cm. Please contact me if you have any questions regarding item size and characteristics. 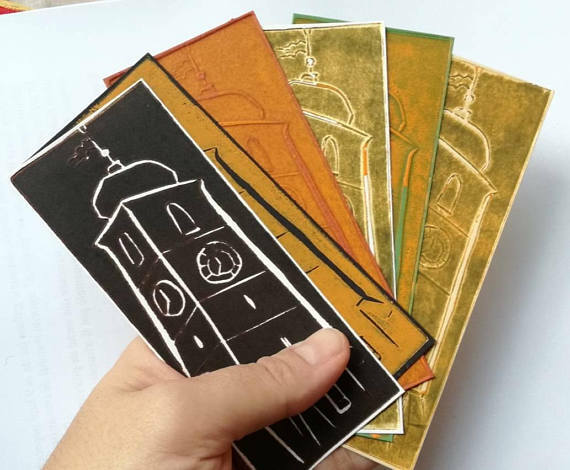 My new creation are these unique bookmarks depicting the old town hall tower of Sibiu, in Transylvania, Romania. 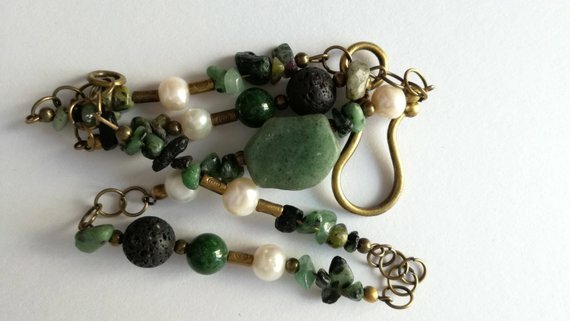 Available in my other Etsy store, the Transylvanian Trove. A shop that wishes to promote the creativity and talent of fellow Transylvanians, past and present. Entirely handmade linocut prints, several combinations of colors available (in both typographic ink and paper). If you have any preference based on item photos, let me know and I will do my best to accommodate (depending on already sold items). Otherwise, I shall randomly choose. 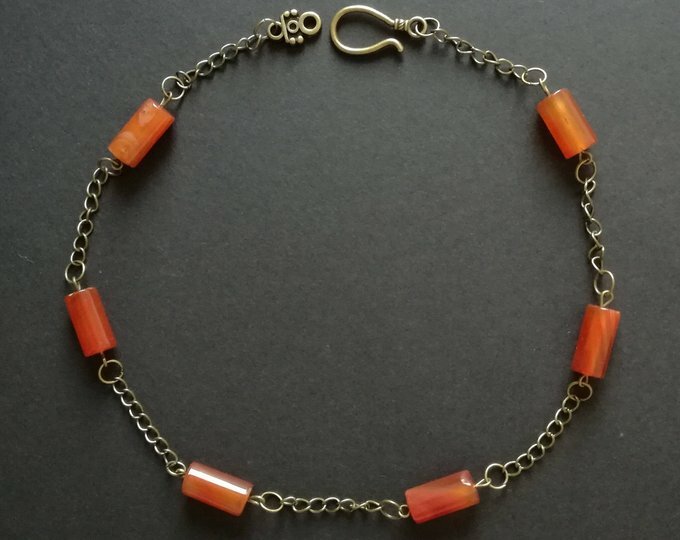 Dimensions: 14 x 5.5 cm. The price refers to one bookmark. Ready to send, ready to use. 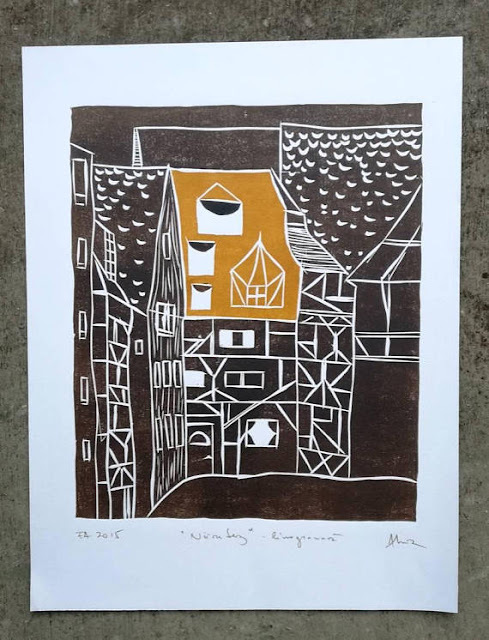 The linocut section in my Goddess Gruia Etsy shop has just been enriched with a new item. 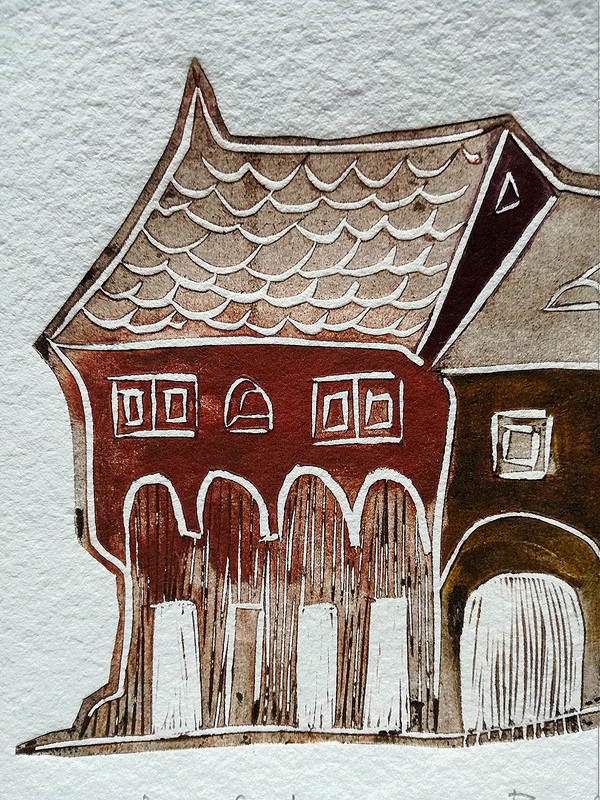 This a special, large-size print inspired by a trip to Nurnberg. The preserved medieval elements of the city are outstanding, matching its fame during the Middle Ages. I was especially impressed by the rich urban houses in the typical Bavarian style, with their organic and decorative timber and daub outlook. It can be offered as a travel souvenir or a nice decorative print. The linocut was made employing a special technique - one cut out plate fragment (for the yellow roof) and ink applied by roller and by hand (for the roof openings on the cut out fragment). Due to this technique, each print is unique, thus not numbered but marked as EA, epreuve d'artiste, author's test copy. 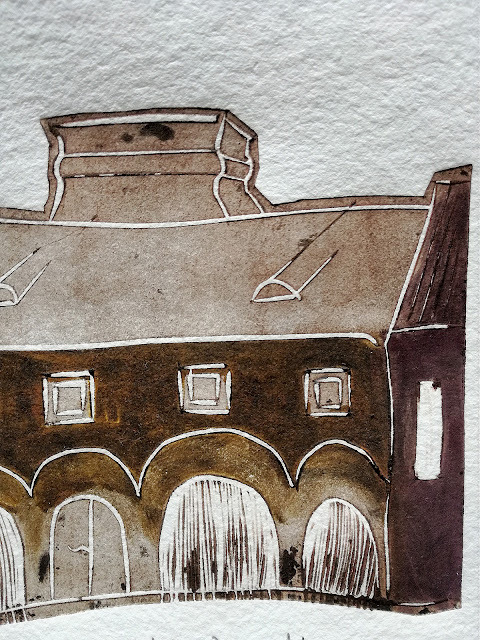 I have used tones of dark brown, black and saffron yellow for a strong contrast. Signed and dated by the author. Total (paper) dimensions: 31 x 40.5 cm. The print shall be sent unframed, rolled in a sturdy cardboard tube. If it becomes a bit curved upon arrival, please roll it in the other direction and leave it thus for one more day in the tube. It will straighten and be ready for framing. I have just listed in my Transylvanian Trove Etsy shop two wonderful etchings created by artist Lojze Kalinsek of Slovenia. 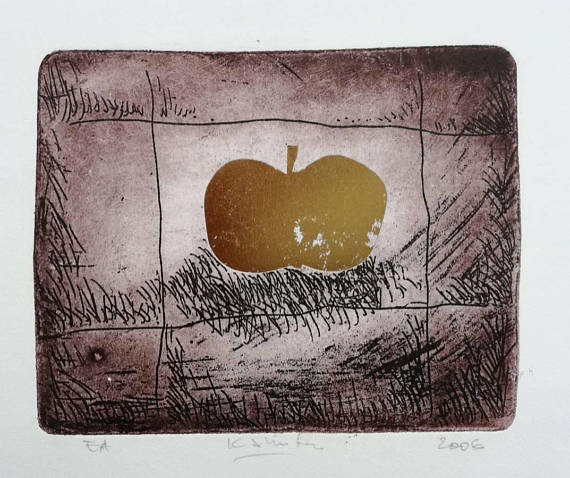 These original prints depicting a golden apple come in two color variants: RED - gold and silver apple embossed against a red background and VIOLET - gold apple against a dark violet background (see variations). The depiction can be interpreted symbolically as a reference to the Original Sin / Fruit of Knowledge from Adam and Eve's biblical story, or as an antique element in the mythological episode of the Judgement of Paris. It can be equally viewed as a decorative, modern element, devoid of deeper meaning. 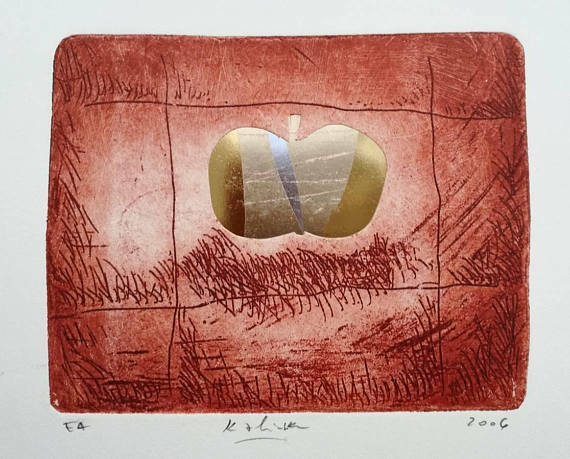 The price refers to one etching, as they can be displayed together as a pair of artworks, or independently, as singular prints. Very decorative, high quality craftsmanship. Excellent decoration for either home or office, classy art gift. 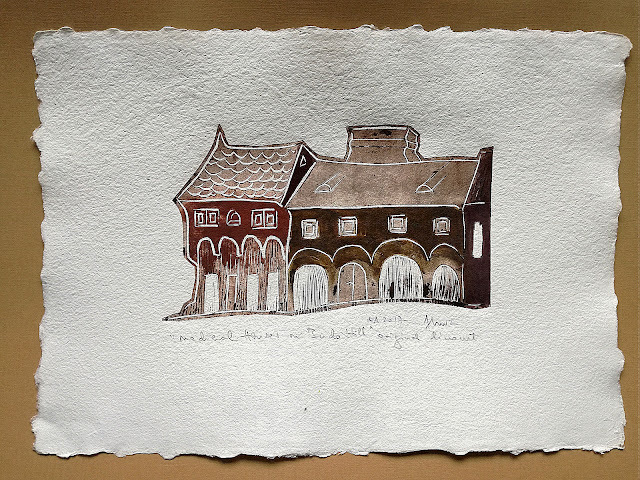 The artworks are sent unframed and you can have them mounted and framed according to your taste and budged. They can also be displayed as they are, due to the thick paper they can be propped up on a mantelpiece, for example. Dimensions (paper): ca. 20 x 22.5 cm. Check out this item in my Etsy shop https://www.etsy.com/listing/573607169/set-of-three-assorted-tobacco-and-tea. 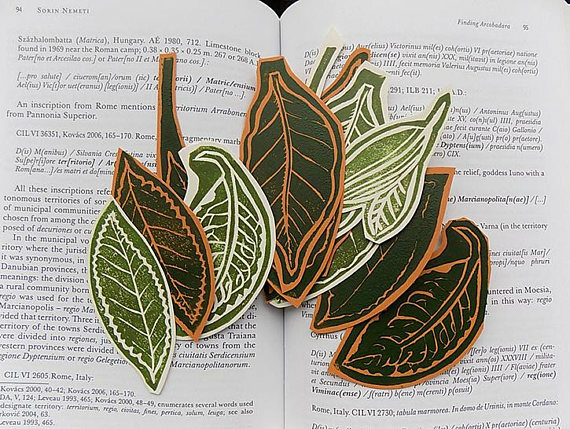 These original, hand-pulled and hand cut linocut bookmarks are available in my second Etsy shop, the Transylanian Trove. he idea was originally a collaboration with a tea shop in Sibiu, so I thought the decoration was ideal for such a context. 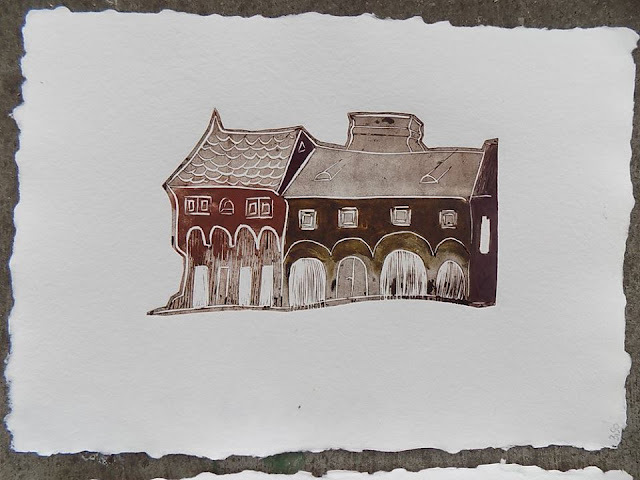 I then extended the project and used the individual lino plates in other compositions as well and for small-size art projects such as this one. The price refers to a set of three assorted items, if you have any preference based on the item pictures, do let me know, otherwise I shall randomly choose. Check out this new item in my Etsy shop, the Goddess Gruia https://www.etsy.com/listing/576488657/linocut-print-on-handmade-paper-medieval. 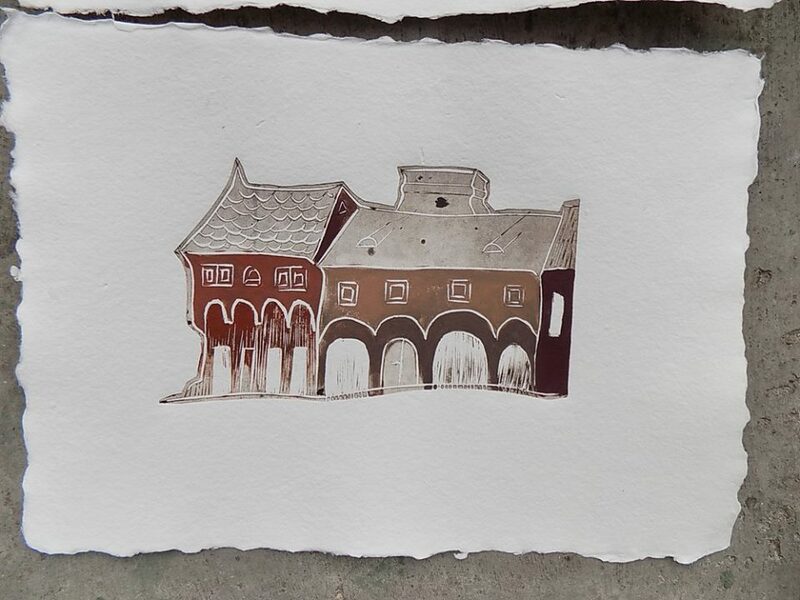 It is part of a small series of three unique linocut prints on handmade paper, depicting medieval houses on Buda Hill, in Budapest. 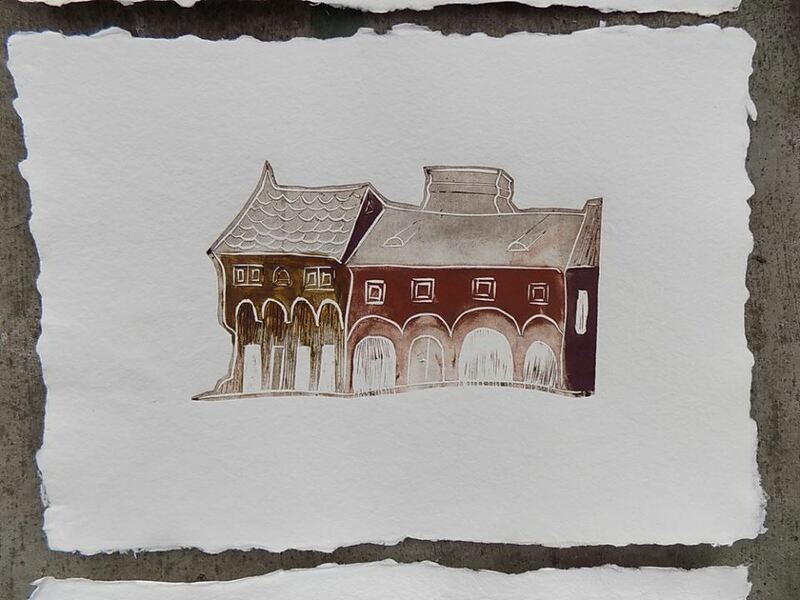 Each print is singular through the combination of colors, as each ink is applied by finger and roller in various combinations, the ink have different consistency and texture, and some parts of the lino plate are second prints. The uncut edges of the paper contribute to the antiquated look of these unique prints. Entirely hand pulled. 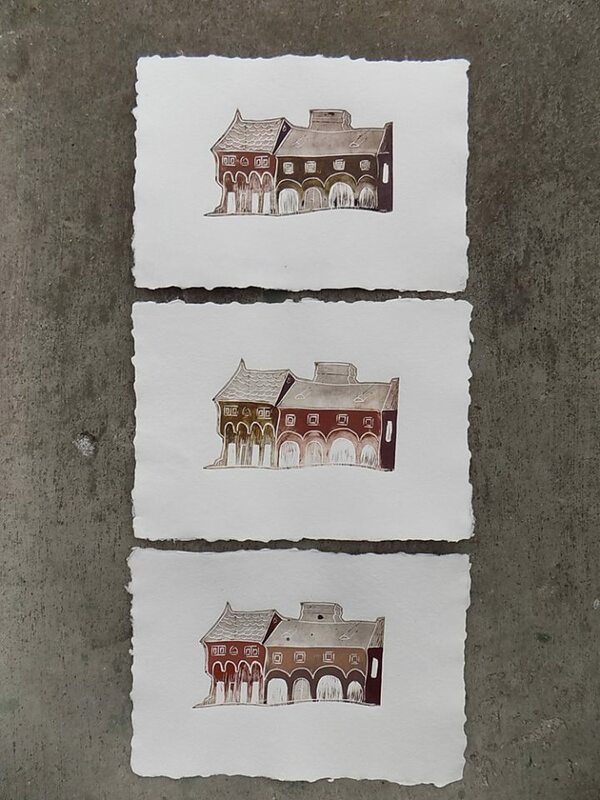 Small series of linocut prints, before signature. 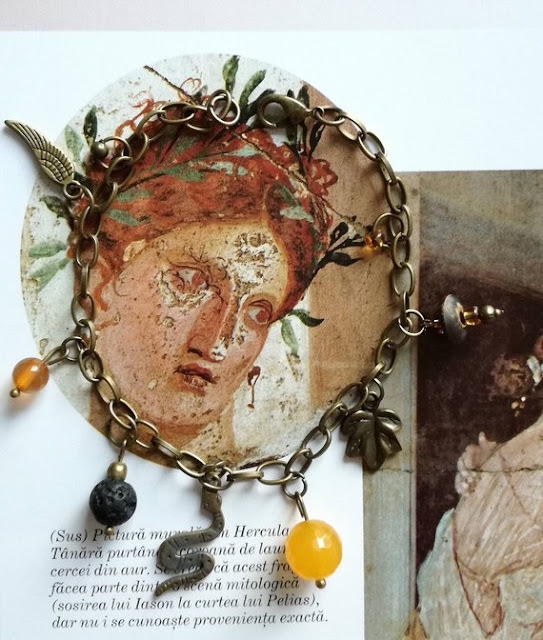 I am a weekend painter and it gives me great joy to go to the studio [aka Goddess Gruia's holy place, her Sancta Sanctorum] for the benefit of all, mostly myself. 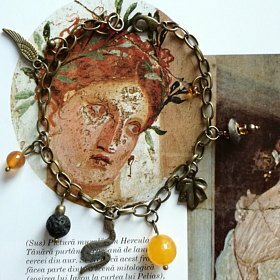 My job is a great source of inspiration - working with historical artifacts and depictions allows me to research past techniques and the effects of time and patina. My profession is another advantage, as an art historian's eye is always receptive to aesthetic compositions and surfaces, even in everyday life. In the spirit of the approaching holidays, my shop on Etsy - the Goddess Gruia - has a special, limited time offer: there will be one or more free linocut bookmarks for every order PLUS free shipping for orders over 50$ (until the end of the year) AND 15% off all listings over 35$ (until November 14th)! 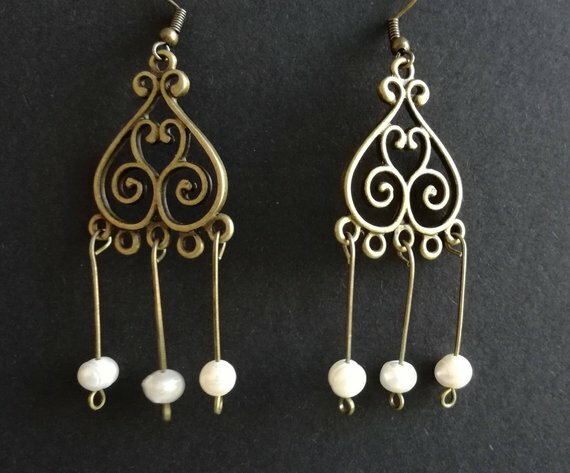 Feel free to check them out on Etsy. 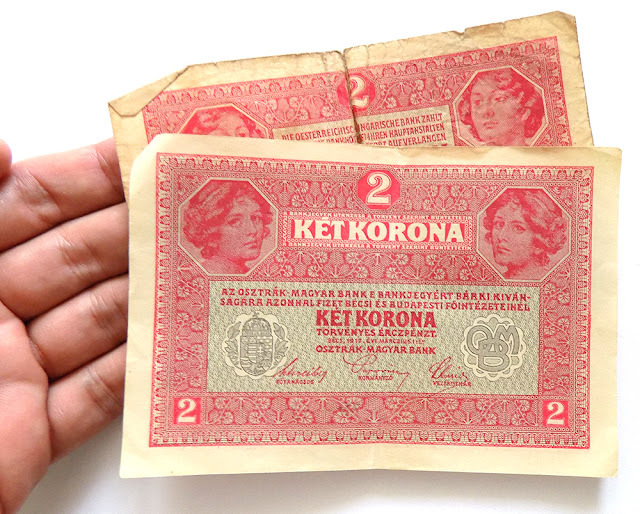 The first is a lot of four circulated twenty filler banknotes from Hungary. 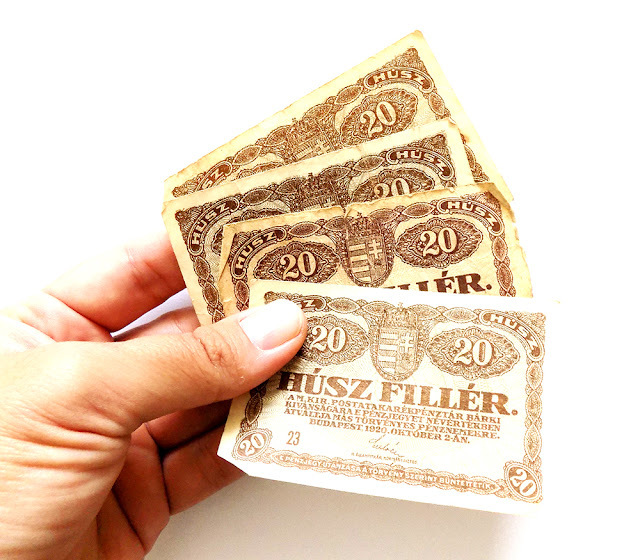 Nominal value: husz (20) filler. 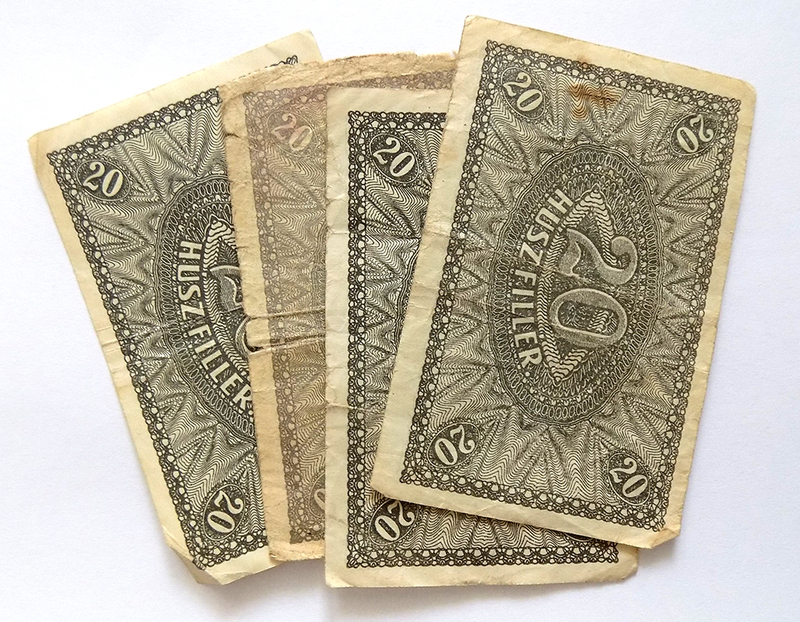 Issued by the Magyar Postatakarekpenztar Bank (Hungarian Post-Office Savings Bank) on October 2nd 1920. Dimensions: 87 X 57mm (3.4 x 2.2 inches). 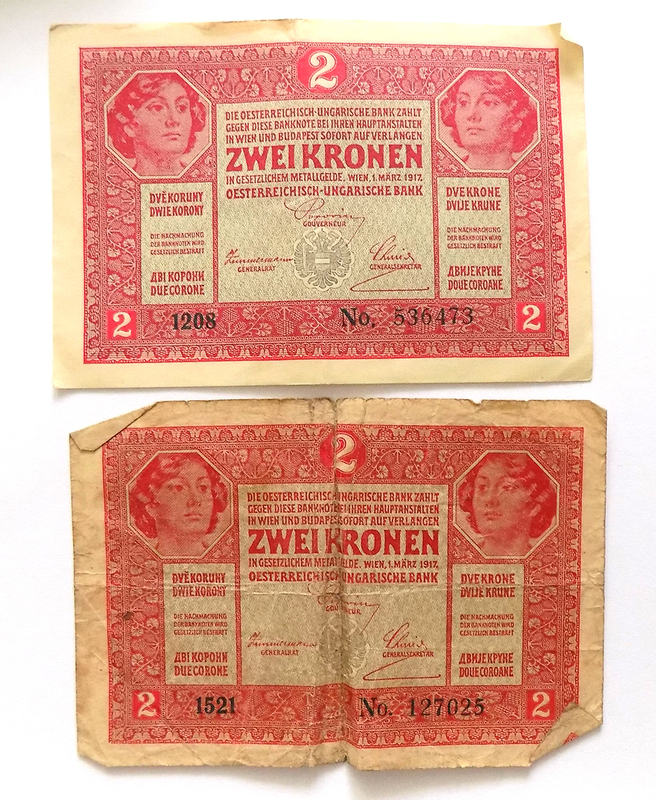 The second is a pair of circulated two crowns banknotes from Austro-Hungary. Nominal value: ket (2) korona / zwei kronen. Text in various languages of the Austrian-Hungarian monarchy (German, Hungarian, Slavic). Issued by the Austro-Hungarian Bank on March 1st 1917. Dimensions: 48 X 32 mm (1.8 x 1.2 inches). See the presentation of krone emissions HERE. About krona and filler (Heller) HERE. Saturday, October 14th, from 11 AM until 3 PM, there is a new workshop at Camp Virtus, near Cluj. 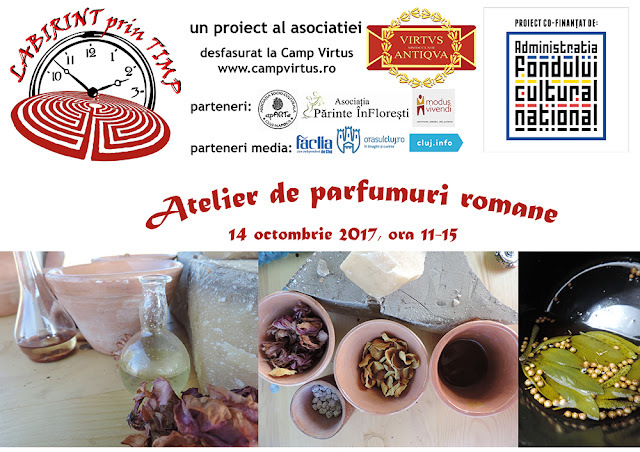 The experimental archaeology and reenactment meeting is dedicated to Roman perfumes, unguents, and creams. 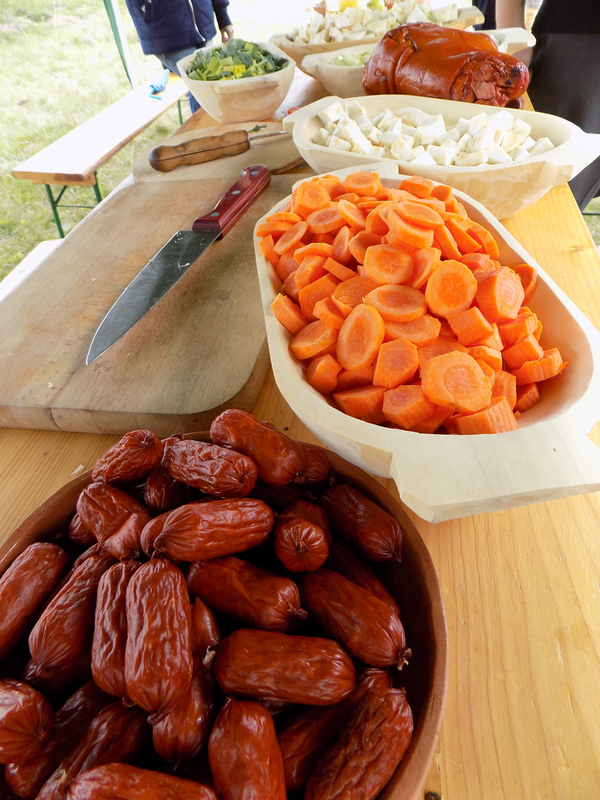 There will be a presentation of the sources and other reconstruction attempts, of the ingredients and procedures, followed by a hands-on workshop and concluded with the tasting of Roman food recipes. 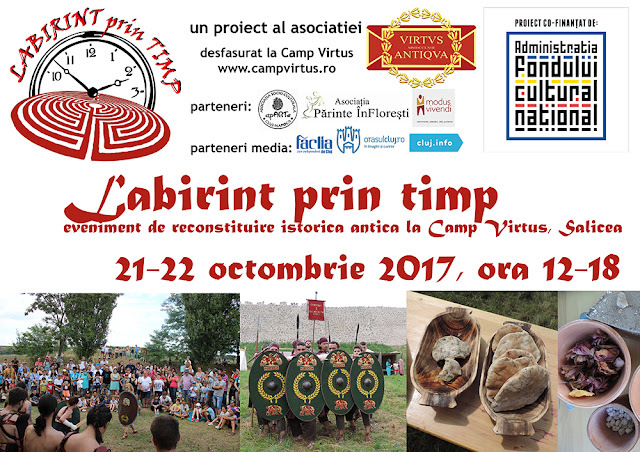 The meeting is part of the "Labyrinth through" time cultural project, co-financed by the National Cultural Fund Administration of Romania and implemented by Virtus Antiqua NGO. The dates are set for the Labyrinth through time event I've been talking about. 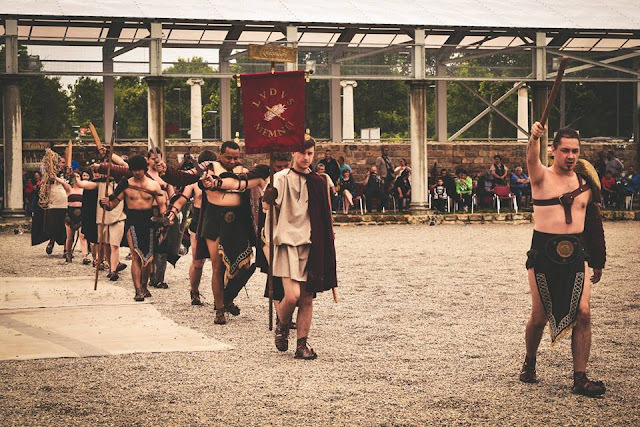 Thus, on October 21st and 22nd the entire hill of Camp Virtus will be transformed in a giant labyrinth inhabited by characters born out of the Antiquity. 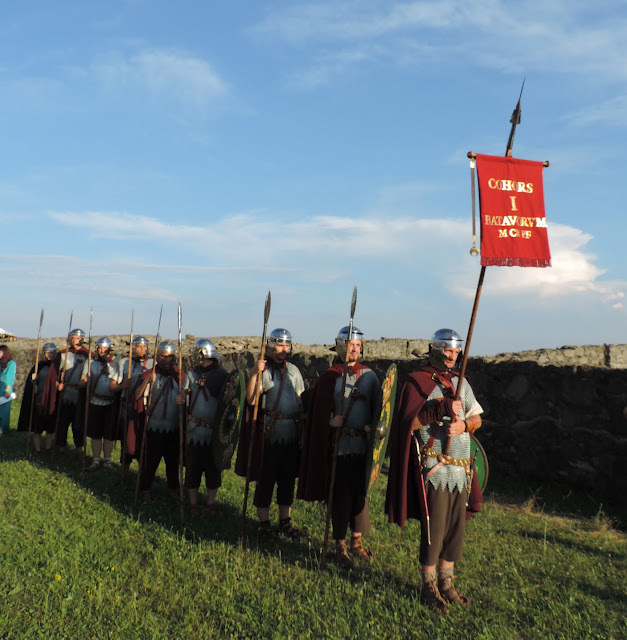 Unlike usual historical reenactment shows in Romania, this is not a spectacle to see but an experience to immerse yourself in. Once in the labyrinth visitors will meet and interact with Dacians, Romans (gladiators, auxiliary soldiers, civilians, priests) and Celts, will smell and taste ancient recipes and snacks, will touch natural samples and guess their ancient uses, will make their own ancient perfumes in unguentaria, will take part in the uncovering of a pottery firing pit and in the reenactment of Roman religious rituals, will weave on a vertical loom, will be able to practice shooting a bow and play Roman board games. There will also be an archaeology corner, with children being explained the principles of excavation and stratigraphy and then discovering strange objects, filing and keeping them. Still, a show part is also included, with gladiatorial fights (munera) and military drills (with commands given in Latin, naturally). The event is family-oriented, with families of volunteers dressed in the era's costumes and inhabiting the labyrinth and the experiences designed with families of visitors in mind, where adults mediate and help the young experiment and learn. Still, all types of visitors are welcome, as access is in no way restricted to them. We shall also hold a special ceremony for the volunteers involved in the weekend meetings, granting them diplomas and prizes, and the final event and a campfire to end the event. 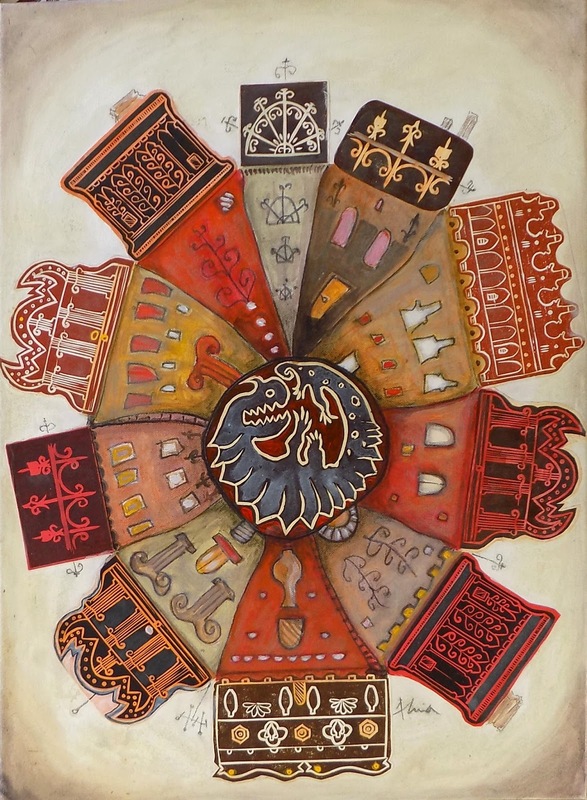 Check out the web page of the entire Labyrinth through time project (in Romanian but with much illustrative material). 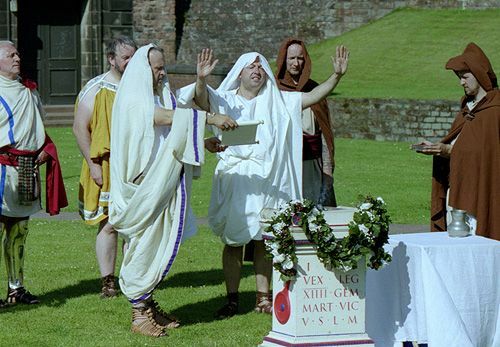 Saturday, September 30th 2017, a group of historians and volunteers from Transylvania are building a remake of an ancient Roman altar, with painted inscription in Latin. The meeting is part of the "Labyrinth through time" cultural project implemented by Virtus Antiqua, a reenactment NGO from Cluj-Napoca. 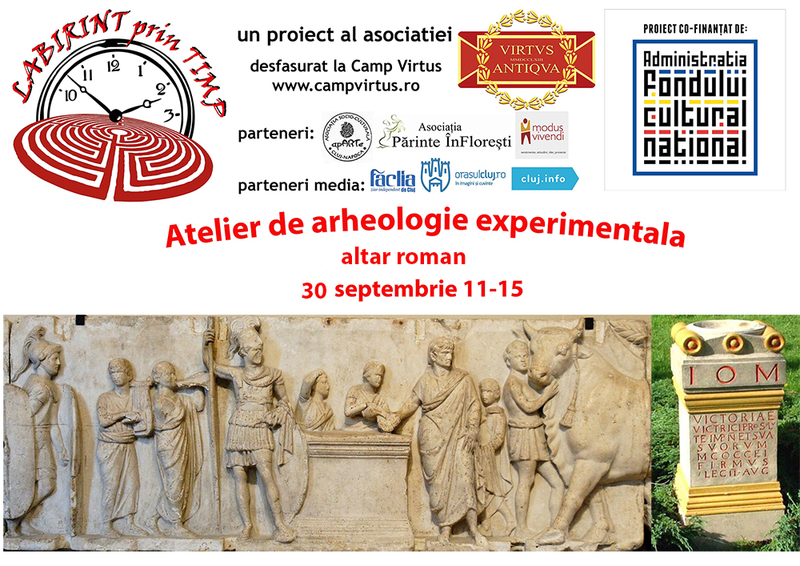 The activity will take place at Camp Virtus, near Cluj, outdoors in the future historical park planned there. 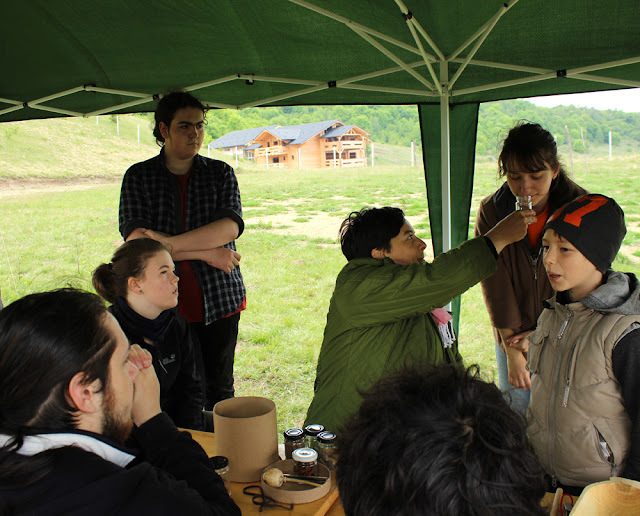 Volunteers and visitors shall receive handouts on the topic [free download of the Romanian presentation], shall work on the experimental archaeology activity and then will be able to taste recipes inspired by those of Antiquity. 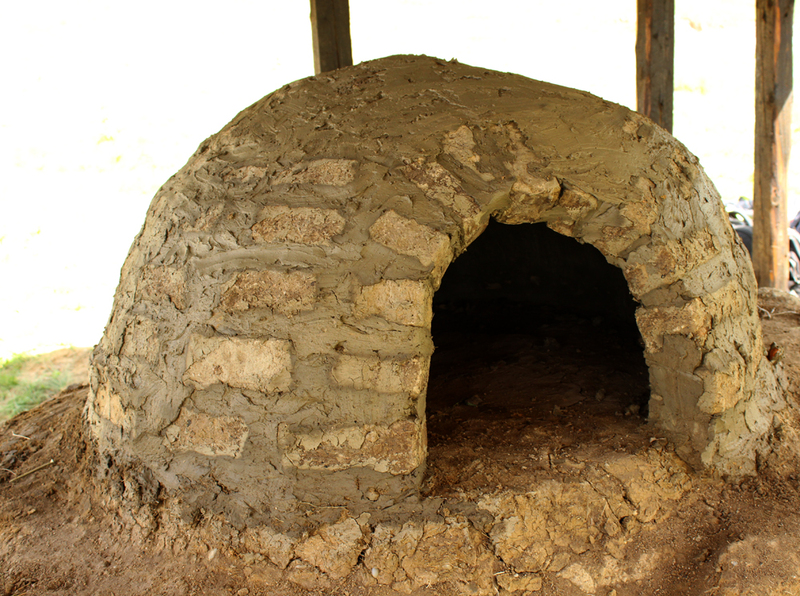 Families are mostly envisaged through this project, but all visitors are welcome - all activities are free of charge. The workshops takes place between 11 AM and 15 PM. A brief presentation in Romanian is also available HERE. Read also the explanation of ARA (altar) in Lacus Curtius HERE.